As tensions increase with Europe and the U.S., Russia has begun looking to Central and South America for trade, investment and military cooperation. RIR’s Tatiana Rubleva discussed Russia’s prospects in the region with Jose Miguel Insulza, head of the Organization of American States. RIR: How would you evaluate the current state of relations between Russia and the OAS? 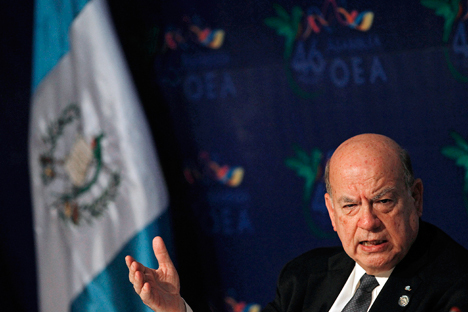 Jose Miguel Insulza: Russia is an observer at the OAS, and a fairly active one. We have good relations and while the OAS primarily fosters multilateral, not bilateral relations, we serve as a certain bridge, which helps members to be well informed of everything that is going on in the Americas. What are the most promising avenues of collaboration between Russia and Latin America? Latin America continues to export a lot of commodities which Russia obviously doesn’t need to buy from us. However, there is still room to significantly improve the trade between Russia and Latin American states. There has always been agricultural trade; there are also some well-developed manufacturing industries in Brazil, Mexico, Argentina, Chile. The cultural exchanges, which during the Soviet times were especially big, are picking up again now. Who is Russia’s largest competitor in this market? China is naturally a big buyer, although it depends on the region. In the case of South America, even though China exports a lot of manufactured goods there, it buys much more than that in terms of commodities and agricultural products. In Central America and Mexico, probably there is more rivalry, but that is largely competition among local products intended for the U.S. market. If Russia goes strong into Latin America, I don’t think it is likely to face very strong competition. The Chinese example, however, proves how big the possibilities in the Latin American market can be. President Xi Jinping has announced a big investment in the region of $250 billion over the next ten years or $25 billion a year. I do hope that happens but it is not going to crowd anybody out – the opportunities of development in Latin America are enormous. How will the revival of the diplomatic ties between the U.S. and Cuba affect the geopolitical situation in Latin America in general? It does change the geopolitical situation in the region a little bit, in a sense that the artificial division that should have been removed a long time ago will disappear. That increases the possibilities for travelling, trade, financial transactions and cultural activity. I think that Cuba is going to change the scope of its diplomatic relations. Do you think the Latin American countries will now adopt a more positive view of the U.S.? Latin American countries are convinced that the U.S. is their top partner and they all look forward to better trade relations with the U.S. Of course, there are some exceptions – one that is mentioned most often is Venezuela. However, 90 percent of their exports are oil, and they have a very good trade agreement with the U.S., which allows them to sell all the oil they want to sell. I think that it is only natural that Latin America, which has grown very strongly in the past decade, is much more open to business and the world than ever before. But that doesn’t have to hurt their main partner, the U.S. - it continues to be the leading trader and investor in the region. Can Latin America become a region where Russia and the U.S. vie for influence as during the Cold War? No, I don’t think this could happen. The need for dialogue between the West and Russia is essential - there are very few choices. But if the dialogue didn’t succeed, the majority of problems would occur in the Eurasian region and not in Latin America.